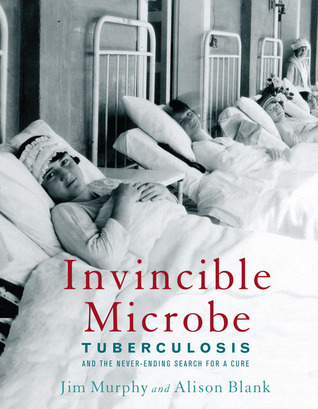 Invincible Microbe: Tuberculosis and the Never-Ending Search for a Cure by Jim Murphy and Alison Blank. Grades 7+ Houghton Mifflin Harcourt, July 2012. 144 pages. Reviewed from ARC provided by publisher. TB is scary. Tuberculosis (TB) has been with us for as long as humans have been around, with millions of casualties. 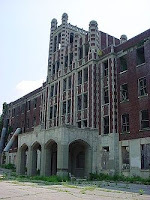 This highly contagious disease had no cure and many sufferers were relegated to sanatoriums until effective antibiotics were developed in the 1940s. Even today, drug-resistant strains are popping up around the world. In Invincible Microbe, authors Jim Murphy and Alison Blank introduce readers to this deadly disease, using a readable narrative nonfiction style and numerous archival photographs. I love a good medical story and Invincible Microbe definitely fits the bill. In addition to being well-researched (extensive back matter is included) and informative, it tells a good story. This is the story of people, especially poor people and minorities, struggling against a foe of epidemic proportions. This is the story of human ingenuity as scientists worked feverishly to discover, test, and manufacture a cure for this devastating disease. This is the story of people thinking they had defeated the microbe, only to be sent back to the drawing board as cures failed and resistant strains developed. The narrative style is very effective at imparting the information in a relateable way. Each chapter moves the reader briskly through the history of people and this illness as scientific discoveries translate into change. Laws are passed to try to clean up the tenements in major cities (breeding grounds for infectious disease), hygiene practices are promoted, isolation of patients is attempted. The many archival photos included help to bring the reader into the story, showing exactly how it was back then. In addition to information about tuberculosis, the book discusses how medical practices have evolved over the years, particularly with regards to minorities. While many people of color were ravaged by this disease, few hospitals or sanatoriums would admit them and governing bodies made it hard for people of color to become doctors and establish their own treatment facilities. Back matter is, of course, nicely done and extensive (we'd expect nothing else from Jim Murphy). The authors include a bibliography and source notes (including useful websites for current information) and an index (index not seen). I'd try Invincible Microbe on any fans of medical stories or anyone interested in medicine or disease. Hand it to fans of Deadly by Julie Chibbaro or Fever 1793 by Laurie Halse Anderson or the nonfiction books Outbreak! : Plagues That Changed History by Bryn Barnard or Phineas Gage: A Gruesome but True Story About Brain Science by John Fleischman. Invincible Microbe is on shelves now! Happy Nonfiction Monday! You can find this week's roundup at Anastasia Suen's Booktalking blog, so make sure you check it out.